Spectral self-interference microscopy (SSM) relies on the balanced collection of light traveling two different paths from the sample to the detector, one direct and the other indirect from a reflecting substrate. The resulting spectral interference effects allow nanometer-scale axial localization of isolated emitters. 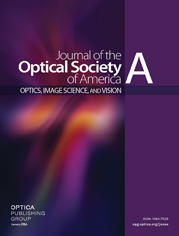 To produce spectral fringes the difference between the two optical paths must be significant. Consequently, to ensure that both contributions are in focus, a low-numerical-aperture objective lens must be used, giving poor lateral resolution. Here this limitation is overcome using a 4Pi apparatus to produce the requisite two paths to the detector. The resulting instrument generalizes both SSM and 4Pi microscopy and allows a quantification of SSM resolution (rather than localization precision). Specifically, SSM is shown to be subject to the same resolution constraints as 4Pi microscopy.